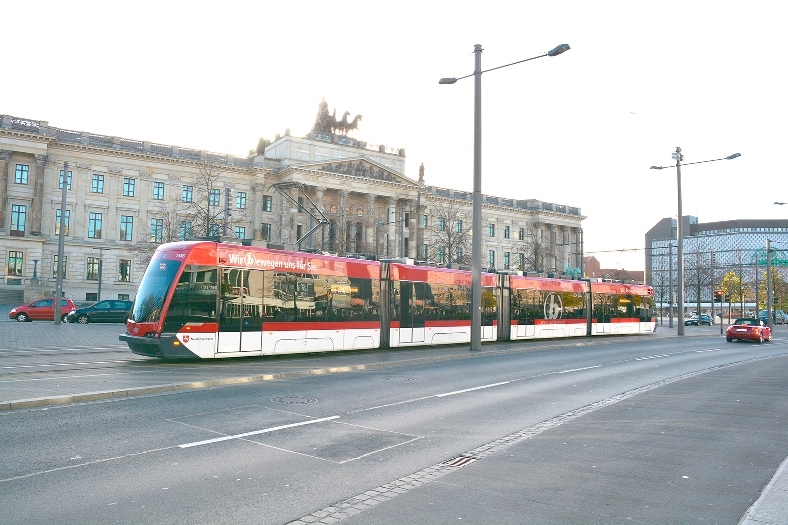 Trams for use in Braunschweig will feature regenerative braking systems for supplying additional power in acceleration. Düsseldorf-based Knorr-Bremse company, Kiepe Electric, is to supply the electrical equipment for seven low-floor light rail vehicles for the city of Braunschweig in Germany, with an option for an additional seven units. The new light rail vehicles will form the latest addition to the fleet of local mass transit operator Braunschweiger Verkehrs-GmbH. Solaris Tram has been commissioned by Braunschweiger Verkehrs-GmbH to supply seven of its Tramino light rail vehicles, with an option for an additional seven units. The Traminos are to be built in Poland by the Solaris Tram joint venture, founded early this year by Solaris Bus & Coach and Stadler Rail AG. In view of its expertise as a systems supplier, Kiepe Electric is to provide the full scope of electrical equipment for this order: traction equipment with energy storage modules, on-board power supply, vehicle control and signaling technology, passenger information, driver’s cab equipment, air-conditioning systems and all vehicle circuit diagrams, plus the necessary software and wiring documentation. Along with the design and supply of the traction inverters and static converters and of the HVAC, ELA, infotainment and video surveillance systems, Kiepe Electric is also to supply the central vehicle control system. The new four-car Tramino light rail vehicles are 36 meters long and 2.3 meters wide, with a passenger capacity of 79 seated and 125 standing. Five of the eight axles are driven, making for better power transmission to the rails. Like their predecessors, these light rail vehicles are fitted with supercap-based energy storage modules. These modules enable the interim storage of braking energy that can then be re-used when the vehicle accelerates.